Place flour, yeast, sugar & salt in a large mixing bowl. On low speed add about 1/4 cup flour until dough forms a mass. Shape dough into a loaf and place in a greased 8 1/2 x 4 1/2-inch loaf pan. Cover and let rise in a warm spot until it’s one inch taller than the pan, about 35 minutes. Meantime, preheat oven to 375° F.
Bake for 30 minutes. After the first 15 minutes, I cover the top of the loaf with a foil tent to prevent over-browning. Note: Check your package of yeast for the proper temperature. My brands require the liquid to be 120° F for instant yeast and 110° for dry active yeast. With dry active yeast the bread may take longer to rise. 85 Comments on "Simple White Bread (with egg)"
Jenny, I was so sad when the same day I found you on YouTube, you made a comment in one recipe that you wouldn’t do any more videos 🙁 but after a month I got the brilliant idea (duh for me!) to check your profile and see that you have a web page!! I just want to tell you that you are a great cooking rol model and that my picky eater (aka husband :)) got me a thumb up when he tried the whole wheat bread I just made from your video in YouTube. Thank you so much!!! It is really delicious! And now I found the white bread recipe and I will do it once the whole wheat bread is gone. Thank you again and hope you can make more videos, I wish you the best!! Thanks, thanks, thanks!!!! If I don’t have an electric mixer and have to mix by hand will that change the final result? Can the milk be whole or 2%? What will be different to the rise and crumb? I used whole milk and it came out really good! In my opinion, it all comes out the same consistency. I have made this bread before and love it. Last night we had freezing rain and then snow here, so I couldn’t get out to the stores this morning. I had no bread and was low on milk. I did have 1% buttermilk, so I thought why not…OMG it came out absolutely fantastic! It was so good I made another recipe which I made up as sandwich buns. Had them with burgers tonight and they were great too. Thanks so much for such an easy and versatile recipe. This will be my go to bread from now on. Just out of the oven. House smells awesomely cozy homey and the loaves turned out beautifully. I made one for Thanksgiving and we’re going to cut into the other one while it is toasty warm…right now! First loaf of white bread, always made whole wheat before. Turned out beautiful….only thing I changed was to use 2 Tablespoons of Maple Syrup instead of sugar, and I added one capful of lemon juice. I also use my Black and Decker bread machine set on the dough setting, as it kneads the dough much more thoroughly than I ever could. I then put the dough into a loaf pan, and bake it according to your recipe. I love your bread recipes, Jenny and make them constantly. Aww, Your awesome. Thank you for the so so easy white bread. I love this easy recipe too. I usually divide the dough in two after it rests for 10 minutes and use two smaller loaf pans. You can get two generous loaves of sandwich size bread! I assume the regular loaf is baked in a 9″x5″ pan. What size do you use when you half the doiugh? with egg recipe. I made two adjustments. I substituted 2 tablespoons of honey for the sugar, and replaced 1/2 cup of the bread flour with a 1/2 cup of whole wheat flour. I baked for 28 minutes to an internal temp of 190°F following all of your other instructions. This loaf was utter perfection! Thank you so much for simplifying breadmaking! Absolutely delicious! I live in Colorado elevation 5,800+ my bread always flops. Do I need to put more or less of something since I do live in a higher altitude? It’s either very dry/crumbly or it falls in the middle while baking.HELP! Sorry, I have no experience with high altitude baking (I’m in California) but there are lots of resources on the internet. T.J.M, I found this on a website so it may help. Might need some adjustments according to your specifics in altitude, but I found it generally had some good tips. I have been making this bread every third day or so for several weeks. My family (3 of us) will not eat old bread so making one loaf often is perfect. I have tried many many one loaf recipes and this is by far the best. We also love the wheat version. Thanks so much for sharing this. Marilyn, 1 or 2 day-old bread is perfect for making french toast. We do it all the time. can I substitute buttermilk for the regular milk? I used buttermilk and I actually liked the bread better than with regular milk. I’ve also used almond milk, and that turns out fine too. The buttermilk separated when I heated it but that didn’t affect the bread. I have made this and the whole wheat version. Both are delicious! After this, it’s hard to go back to store-bought bread. Thank you! I’m in the process of making this bread and realized I forgot to grease my loaf pan before putting the dough into the pan. Should I expect my bread to stick to the loaf pan after I bake it? I’m using a glass Pyrex loaf pan. Thanks, Jenny! Love this site, and I’m so proud of our Eagles for winning the Super Bowl. thank you for this recipe, very very good. i make this loaf at least twice a week. it’s so easy to make and taste better than store bought. the grand kids love it too, they are always asking me to make some. I LOVE your rustic bread recipes! I am trying to bake for my lactose intolerant brother, can I substitute water for the milk in this recipe? Just a note, I added some dill juice to your rustic rye, it gives it a great flavor! Made the white bread yesterday using water instead of milk. Wonderful recipe Jenny! I just joined. You make everything look so easy. I don’t know if mine will look anything like that. You are hilarious. I am glad I found you. I am on WW so I am glad that you have healthier recipes. Thank you so much. The loaf I just made looks spectacular and has a wonderful “feel” (crumb?). It was certainly easy to put together. However, I think it lacks any real bread flavor. Perhaps that’s because it has only one, relatively brief rising? I used sugar, not honey. Maybe that would have given it some flavor. OR maybe it’s just me. . . . Try increasing the salt a little. I made this yesterday using my K.A. 4.5 Qt. with the dough hook. Since I was just making one loaf I didn’t pull out my 8 Qt. N.S.F. “Monster K.A.” LOL. Thank you for pointing out that the directions clearly state when using the dough hook never go above power level 2. I was bad and ran it on power 6! Did you mix it longer than what Jenny states due to the lower power? Just curious. I’m also curious to know how high your dough rose during the 35 minute proofing time. Mine rose about 4 inches above the rim of the loaf pan! 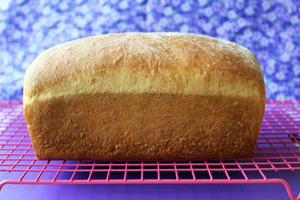 (Almost double) and I’m thinking of upping the size of the loaf pan to a 10″ x 5″. Thanks again for your sage advice. Happy baking. If you have a microwave oven, you have a proof box in your kitchen! Just boil two cups of water and leave them in there. Place your covered bread pan inside to rise. Close the door. The end and works every time! Could you let me know how long you knead in the mixer? I initially tried the whole wheat recipe to the letter, fresh ingredients, doing 2 minutes in Artisan then 50 turns but the bread came out crumbly and fell apart. Have tried a 2nd batch doing all in the mixer but wasn’t sure how long to knead in the mixer-ended up 8 minutes on the #2 setting. May have kneaded too long? as it was trying to climb the dough hook – a bit. But, w/this method (adding 1/4 cup addn’l flour), the dough never came away clean from the bowl. However, the bread is much better, not falling apart and not as crumbly. I tried this recipe. It turned it great! How long can you store it for? Hi Jenny, thank you for this wonderful FREE website without ads. I made the wheat bread for the 2nd time today and now I’m wondering what the best way to keep it is? It will be lunch bread for my daughters, so it needs to last for 2-3 days. I made the granola bars yesterday and both kids said they loooved them and no more store bought ones! I read your story, amazing! PS. You, Ricki and Montel were my tv addiction when I arrived in the States in -93 🙂 Good times! Hi Jenny, made this loaf today and forgot to add the sugar. Also used whole milk. The loaf turned out perfect. Thank you. Will be trying more of your recipes soon. Dear Jenny, I just love your recipes, I have made several and they came out fantastically well but I would like to ask you a favour. Could it be possible for you to include metric measurements for weight and volume? Since cups in Spanish are not used, and as you know, sometimes equivalences are not perfect (mostly for baking). The best I can do is the metric conversion chart at the top. I hope it helps. I have baked lots of bread over the years…using a very damp paper towel to cover the loaf pan. IF the paper towel dries out before the bread has risen enough…all you need to do is spritz the towel with a spray bottle of water…to dampen it again…BEFORE you try to lift it off. I have used this method for many years and it always works. If I add in cinnamon and raisins in the 4th step, do I cut down on the sugar?And does it change the cooking time? Thanks! Love your recipies! If you add the cinnamon to the loaf it will change the color or the loaf, Will still taste great along with the addition of the raisins. You may not care for the appearance of the loaf . The sweetness is a matter of your individual taste. as the raisins will increase the sweetness of the bread . If you prefer If sweet keep the sugar amount as stated in this recipe, if not reduce it slightly. Or, make Jenny’s Cinnamon Raisin loaf recipe. Either can be braided or rolled to bake in a loaf pan. All of the recipes here are simple and easily adapted, if you felt the need to do so. Hi Jenny, I’ve made both your white bread and wheat and both came out fantastic ! I love your recipes. Tried most of them. I have only made it with 1% milk but let us know how it turns out if you switch to 2%. I have made with whole milk today and it turned out as usual..great! I used whole milk yesterday. Turned out fantastic. The only thing I may try differently this week is to up the size of the loaf pan from the 8 1/2 x 4 1/2 to my 10 x 5 loaf pan (I use USA Pans, the same manufacturer that King Arthur & Williams Sonoma uses to manufacture their pans). The reason I’m going to try this is that the dough rose at least 3″ + over the top of the pan during the 35 minute rise time. Duh! I should have watched Jenny’s YouTube video for making whole wheat bread!!! Jenny watches the dough during the 35 minute proofing time and doesn’t let it rise above an inch over the pan. I was wondering, could I add like sultana or raisins in the bread and if so, which step should i put it in? I would add it in step #4. Just fixed this bread, I doubled the recipe and the other half I made cinnamon swirl bread. Came out so good. Thank you for the recipe. I make this bread so many times and everytime comes out soooo good, also I try the wheat, with egg & without, perfect everytime, thanks so much for making bread so easy and tasty! Found your site by accident 2 days ago. Since then I have been watching the recipes that you have put on video. I am a retired teacher and you are an excellent teacher. Your videos leave nothing to question about the recipe if you want to make it ‘as is.’ I am trying the white bread recipe with egg. I really appreciate all the comments from others that are included after each recipe. I am so happy I stumbled onto your website. Thank you! I never knew baking bread was so easy till I started reading your receipts. At 67, I now love making bread every week. Thank you so much for your easy, foolproof method. Can I freeze this bread? Any bread can be frozen but to me it’s always better fresh. I made this earlier today and it is TERRIFIC!!! and so FAST. I was low on milk so I used buttermilk What a flavor!!! Thanks Jennny from Canada. I’m curious as to where you got the pink cooling rack. Must know! Oh, okay. A do-it-yourself project. I love it! I made this bread a few days ago, adding 3 eggs plus honey, and alot of grated white cheddar cheese in the final knead.. Of course a little more flour was needed but the original recipe is very forgiving. It was delicious!! Toasts great. Thank you so much for your recipes, Jenny!!!! Oh, and I cannot wait to make your cabbage rolls!!!!!!!! Did you use both honey and sugar? I like using honey, the bread stays fresh longer…and tastes better to me. The cheese sounds good, I may try it. Yes, I used only honey and agree the bread stays fresh much longer plus has a very rich taste. I have two whole wheat loaves rising now that are about to go in the oven. With these I added a little honey, agave and molasses (I just eyeballed each) along with the eggs and milk. Can’t wait until they’re done. These recipes are very simple and easy to adapt other ingredients, if you want. Either way they always turn out perfect and are easy to follow. 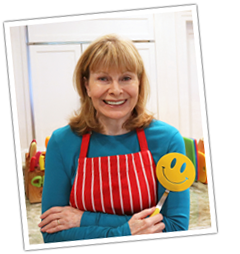 Jenny I have just found your site today and my mouth is salivating, your recipes look so easy, I have made the no kneed bread before but my water was only 110F and i let it sit for 12 to 24 hours….your version is so much quicker. I have only made it as one loaf. You could check around for other recipes to see about doubling. Every week I make the egg version doubled. It works. I have done it in both my Bosch Universal and KitchenAid. I have used powdered milk and fresh milk, half white whole wheat/half bread flours; and both 100% bread or 100% white whole wheat. Every loaf has been eagerly awaited and eagerly devoured. This is a fantastic recipe, Jenny! The only thing with the doubled recipe is that the mixture creeps up the beater of the KitchenAide during the two-minutes of beating. It’s a bit of a pain to get it out of that spring at the top but I just live with it. I have also used the single loaf recipe divided into two small, 4″ x 8″ pans. It makes a more practical size for just one person. Tonight I’m going to try buttermilk powder and 100% bread flour. I like to experiment. Thanks for sharing this helpful info. Thanks for your comment, it is interesting for me, as I would like to know what difference it makes if done with normal flour or with bread flour, I suppose that bread flour will give a tougher, less moist texture than the usual normal one, used in cakes, right? Let me know the exact measurements, if you can, so that I can decide what to begin with, since it is always interesting for me to learn to get the best from everyone. By the way, I am from Barcelona, Spain… Far away from all of you guys, but thanks to email close enough to share anything ! If you want me to send you typical spanish recipes, let me know! Jenny, I decided to try white bread after having such good luck making your whole wheat bread. I am wondering what the egg does to the bread. Knowing that may help me decide which recipe to try first; this one or your recipe without egg. Can you please explain to me how the egg changes the bread? Thank you very much! I don’t know how it changes the bread but I know that this loaf is softer, taller, and more moist. If you try them both, please let us know what you think. I tried the no egg version today and decided I would go eggless from now on. I can’t wait to try the whole wheat bread without egg as well. It turned out softer, lighter, rose higher and more quickly than with an egg. I think it also tastes better. This is the result I’ve spent years trying to achieve. I followed your eggless recipe exactly except I kneaded the dough for 10 minutes, let it rise (double the size) then shaped into a loaf and let rise to 5 1/2″ high. I baked it for 10 minutes then covered with foil and baked for an additional 15 minutes. Perfection!!! Thank you, Jenny! I would like to ask you what kind of flour did you use for this last option, which I would also like to make? I am from Barcelona, and love Jenny’s recipes! LOOKS REAL GOOD. I HAVE TO TRY IT. GRANNY FAN from way back to your talk show days.